Newsroom > Press Releases > How Much Do Supplemental Health Insurance Products Cost? 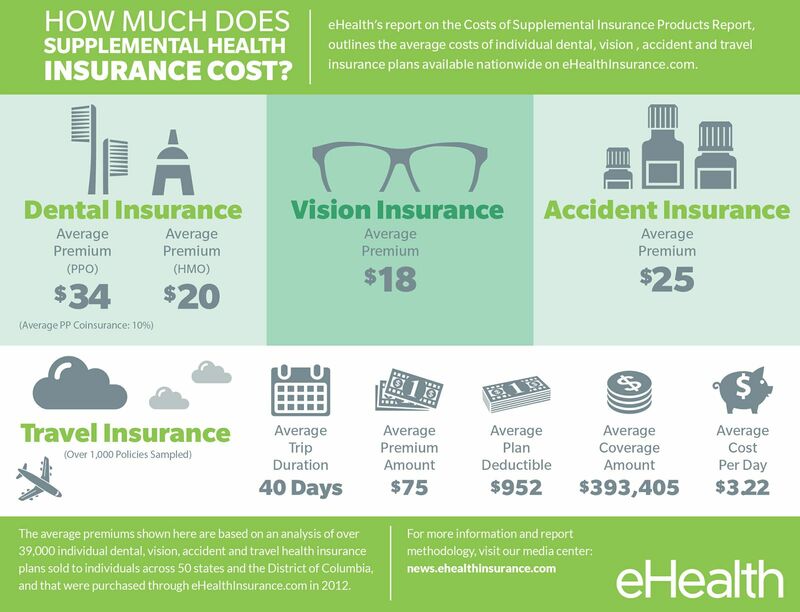 How Much Do Supplemental Health Insurance Products Cost? MOUNTAIN VIEW, CA -- 12/23/13 -- Today, eHealth, Inc., which operates eHealthInsurance.com (http://www.ehealthInsurance.com), the Nation's first and largest health insurance exchange, published the Costs of Supplemental Insurance Products Report, which outlines the average costs of individual dental, vision, accident and travel health insurance plans available nationwide on eHealthInsurance.com. The objective of eHealth's reports on cost and benefit trends in the individually purchased health insurance market is to provide a national perspective on trends in the market for supplemental insurance products, based on an analysis of a geographically distributed sample of insurance policies. This report analyzes plan data from a sample of over 39,000 plans sold to individuals from 50 states and the District of Columbia that were purchased through eHealth in 2012.
eHealth has been publishing reports that analyze the costs and benefits associated with individually purchased major medical health insurance plans, as well as other supplemental and ancillary health insurance products, since 2005. Licensed in all 50 states and the District of Columbia, eHealth is one of the few organizations with national source data reflecting consumer buying patterns and purchase prices in the individual and family health insurance market. An analysis of over 25,000 policies for dental insurance that were sold through eHealth in 2012, showed that individuals (regardless of age group) paid an average of $30 per month for a dental insurance policy. Among HMO Dental Insurance plans, the average premium was $20 per month. Among PPO dental plans, the average premium was $34 per month. Altogether, 34% of PPO plans had coinsurance and the average coinsurance rate per plan was 10%. An analysis of over 15,000 policies for vision insurance that were sold through eHealth in 2012, found that the average monthly premium for vision insurance was $18 per month (regardless of age group). The majority of vision insurance plans sold through eHealth were purchased by individuals between the ages of 25 and 34 (34% of all vision insurance policies sold by eHealth in 2012). The table below outlines the cost of individually purchased vision insurance plans. An analysis of over 8,500 policies for accident insurance that were sold through eHealth in 2012, found that the average monthly premium was $25 per month, regardless of age group. The majority of accident insurance plans sold through eHealth were purchased by individuals between the ages of 25 and 44 (59% of all accident insurance policies sold by eHealth in 2012). On average, men paid more for accident insurance ($25 per month) compared to women ($24 per month). The table below outlines the cost of individually purchased accident insurance plans by age and gender. An analysis of over 1,000 policies for travel health insurance that were sold through eHealth in 2012, found that the average length of stay for an individual, regardless of age group, purchasing travel insurance was forty days. The average person paid $75 for a plan with a $952 deductible and $393,405 worth of travel health coverage. For trips lasting seven days, the average cost of a travel insurance plan was $20; for trips lasting fourteen days the average cost was $29; for trips lasting twenty-eight days the average cost was $45; and for trips lasting thirty-five days, the average cost $40. This chart breaks down travel insurance applications by age, gender, average trip duration and average cost. This chart breaks down the percentage of travel health insurance plans purchased at the varying coverage limits, and the average deductibles people selected at the coverage limits for plans sold through eHealth. The eHealth report also analyzed the cost of individually purchased dental, accident and vision insurance plans purchased on a state-by-state basis. This state-by-state analysis only includes states where eHealth sold at least 100 policies of each type of insurance in 2012. The report analyzes the monthly premium costs and some of the benefits associated with dental, vision, accident and travel insurance plans sold through eHealth in 2012 across the country. State-specific data in this report is limited to states where eHealth sold a minimum of 100 policies, by type, in 2012. States with fewer than 100 active policies were excluded from the reporting of state-specific prices and benefits. The 2012 plan data referred to in this report is derived from approximately 39,000 individual dental, accident, vision and travel insurance policies sold in 50 states and the District of Columbia, and purchased through eHealthInsurance.com in 2012. This report analyzes monthly premiums paid for these various types of insurance policies in 2012 along with some of the benefits and coverage levels associated with those plans. The data contained in this report represents only those consumers who shopped for and purchased insurance products through eHealthInsurance.com.